We have Paperless Society Solution, If you have Computer in your institution/Organizations, it does not mean that your setup is computerized. Even if any institution /organizations have Computers; they are working manually because they do not have computerized software solutions. That means you are not really using your computer in a positive way because nowadays all banks are giving the high-tech facilities to their customers then why you are not. Win-Society, this is a product name to specially designed for Thrift & Credit Societies. Win-Society, is a windows-based solution for Thrift & Credit Societies having high tech features i.e. Message on member’s mobile on his every transaction in the shape of SMS and another feature for Web-Site connectivity to display the member’s complete KYC, all type of accounts balances with transactions. 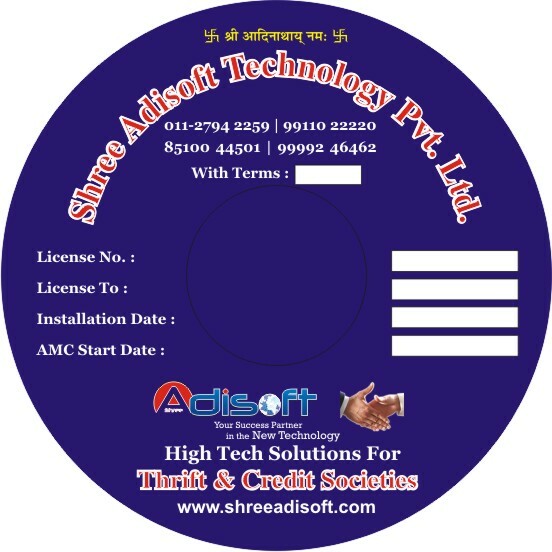 SHREE ADISOFT is also to use full to reduce your papers work from your society like Voucher, Receipt, New Membership form with member's photo, New loan form, passbook, FD Certificate, Share Certificate, Cheque printing, defaulter letters, arbitration letters all other reports which you want to add to this software because we have very good concept of interfacing with Microsoft Office. You are so far from SHREE ADISOFT Win-Society Projects only a single click or visit in our office. Our aim to reduce the paper work in the society like Receipt, Voucher, New Membership Application & Form, Loan Application & Form, Loan Form Diary Printing, various types of application received like Loan Application, Amount withdrawal from CD/OD, FD/RD Pre – Matured and Resign Application with feedback. Share, Fixed Deposit & Interest Certificates Printing. Post Dated Cheques received and acknowledgement, Cheque Printing, Surety Verification, Demand Register, Defaulter Register, Notices, Arbitration & Legal Cases and many more………………. New Membership Welcome message to member. Nominee's Confirmation Confirmation message to Nominees. New Loan	Loan issued confirmation message to loan applicant with loan amount and alter message to all sureties those given to this loan. New Deposit	Thanks message to members for deposit with us with deposit amount. Receipt Entry Amount received confirmation message to the member with mode of receipt along with the entire account types balances like SM, CD, OD, Regular Loan, Emergent Loam Recurring Deposit, Fixed Deposit etc. Payment Entry Alter message to member for amount withdrawal from his account with available all account type balances. Notice Sent Alter message to member for Notice send with the charges amount with his sureties. Debit and Credit Messages sent for each Credit and Debit to your account. Loan Issued Whenever your loan application approved by the society you got a message on your registered mobile no to your loan Amt. Rs….. has been approved. Surety Given Messages are sent to all those members who are given the surety to any loan account. New Deposit Message for you Deposit Certificate has been ready to collect from the society. Deposit Matured Whenever your deposit is matured you got a message to collect the maturity amount or give the instruction society to renew it. Cheque Return Whenever cheque issued is returned a message intimating about the same will be sent. 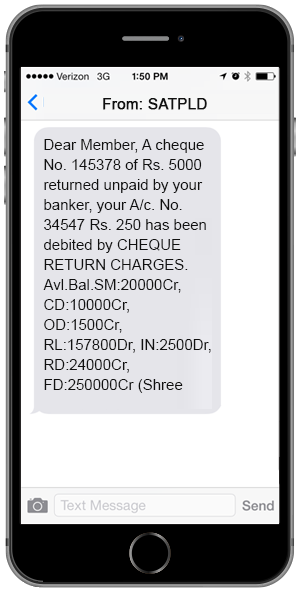 Misc.Alert Message All alert message like Cheque Return, Defaulters for Loan, Recurring & CD, Notice, Surety given, Loan due instalment on every month etc. Customized Message Customized message for Diwali, Holi, New Year, AGM, Election and more. SHREE ADISOFT it’s based on 100% parameterized in Society Parameters control, including basic information Society can set the controls for auto voucher numbering as per terminal wise, date wise or running and same is in receipt numbering. The parameters for Fixed Deposit, Recurring Deposit, Loan Bond and Share Certificate numbers auto generation is also parametrized. SHREE ADISOFT design this application in four categories. All these categories having 100 types of subcategories with all customised control parameters for interest and charges. Society can set the new account types with interest calculation method like daily, monthly, quarterly, half yearly and yearly basis on compound, non- compound. IN CASE OF RECURRING DEPOSITS, user set the interest option, pre-matures allowed, instalment after period (maturity date) and late instalment charges will applicable or not. IN CASE OF FIXED DEPOSITS, Society can set the scheme like double, triple, five and 10 times of deposit, maturity amount should be display or not it is also depending on his hand. Interest after maturity and pre-matured allowed or not can also set in this scheme. In case of non-compounding scheme Society set the controls for monthly interest payment auto transfer in his respective account which is set in the parameters. IN CASE OF LOANS, the method of demand calculation is depending o the society that is Auto demand or monthly demand, in case of Auto demand there is no need to run the process for interest calculation system will take care it self as per last payment received date in loan either interest. Late payment charges by penal rate or fixed charges and both is also parameter based. The demand for new loans will be calculate at the time of loan issue as an advance interest with the parameter of ½ month interest or full months interest or issued days based. Win-Society having Secured loan (loan against fixed deposits, loan against GOLD, loan against Property etc.) and un-secured loan (it’s based on sureties of the existing members so that system will take if loan comes in the legal cases and will send the all legal notices to his sureties) information concept. Through the Win-Society application Society can maintain the Non-Members and Minor accounts with the separate accounting effect in the BALANCE SHEET. BALANCE SHEET based parameters can be set the Society at this end so that they can watch the profit and from each and every account type. SHREE ADISOFT having 13 types of passbook format and each format having separate controls with the size of passbook and design. Society Members can login through his Membership Account No and Password (allotted by the Society in first time after than member can be change) in the Society Dynamic Website (developed by SHREE ADISOFT) and check his full KYC, all account type balances including the transactions of the period. It’s a type of interface and Society will upload the data on this site in CSV format. The CSV format will generate by the SHREE ADISOFT Win-Society application. No need of this process in the SHREE ADISOFT Win-Society application, it’s a base of parameters. SHREE ADISOFT Win-Society is allowed to login in the application with USER-ID and Password only, without USER-ID and Password no one can enter the software. Administrator can assign to each user for his work area through USER-Rights. Win-Society maintain the record and write the name of operator with date, time and machine name on every working by the particular USER like New Member’s creation, KYC modification, Receipt entry, Voucher entry, Loan issues, Fixed deposit creation, Cheque return, Notice sending etc. Win-Society writes the log and give the report to the authorized person for any kind of discrepancy. No any back dated entry posting, deletion and modification is allowed without helping of Administrator.